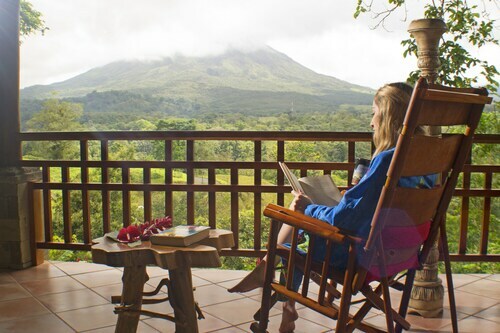 This family-friendly La Fortuna lodge is located in the mountains, within 2 mi (3 km) of Arenal Volcano National Park and Ecotermales Fortuna. 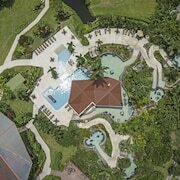 Ecoglide Arenal Park and Arenal Adventure World are also within 6 mi (10 km). 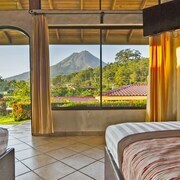 Situated in the mountains, this luxury hotel is within 1 mi (2 km) of Ecotermales Fortuna and Ecoglide Arenal Park. 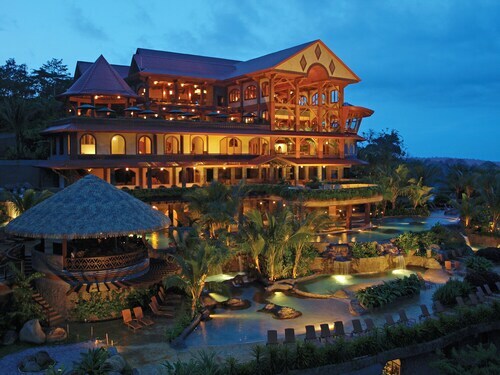 Arenal Natura Ecological Park and Costa Rica Chocolate Tour are also within 6 mi (10 km). This family-friendly La Fortuna hotel is located near the airport, within 1 mi (2 km) of Ecotermales Fortuna and Ecoglide Arenal Park. 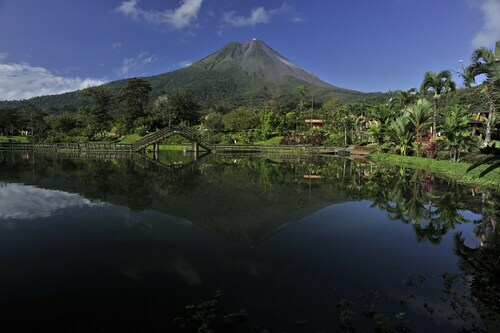 Arenal Natura Ecological Park is 1.6 mi (2.6 km) away. 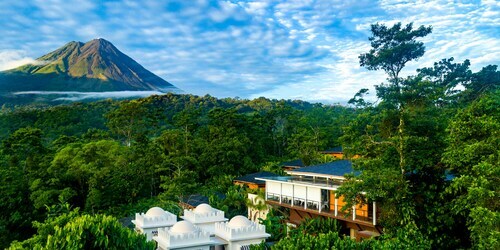 Situated in a national park, this spa lodge is 1.7 mi (2.7 km) from Arenal Volcano National Park and within 6 mi (10 km) of Arenal Volcano and La Fortuna Waterfall. Lake Arenal and Mistico Arenal Hanging Bridges Park are also within 9 mi (15 km). 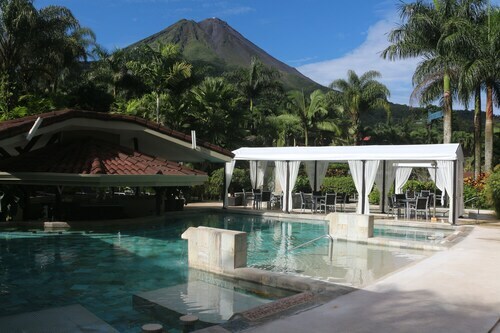 Situated near the airport, this luxury resort is 1.6 mi (2.6 km) from Arenal Volcano National Park and 1.8 mi (2.9 km) from Ecotermales Fortuna. La Fortuna Waterfall and Mistico Arenal Hanging Bridges Park are also within 9 mi (15 km). 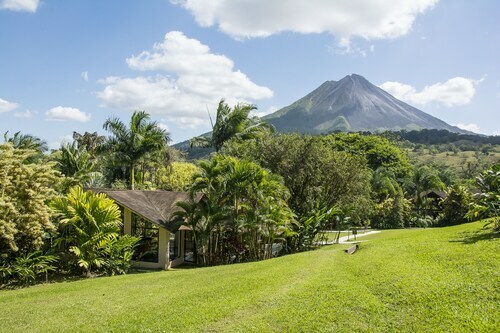 Situated on a river, this luxury resort is within 6 mi (10 km) of Arenal Natura Ecological Park, Arenal Volcano National Park, and Ecoglide Arenal Park. La Fortuna Waterfall and Mistico Arenal Hanging Bridges Park are also within 12 mi (20 km). 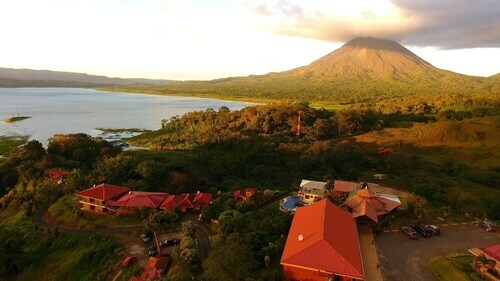 This family-friendly La Fortuna resort is located on the riverwalk, 3 mi (4.8 km) from Arenal Natura Ecological Park, and within 6 mi (10 km) of Ecoglide Arenal Park and Mistico Arenal Hanging Bridges Park. 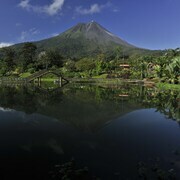 Arenal Volcano and Cerro Chato Lake are also within 9 mi (15 km). Situated in La Fortuna, this luxury hotel is 1.6 mi (2.6 km) from Arenal Volcano National Park and 1.8 mi (2.9 km) from Ecotermales Fortuna. La Fortuna Waterfall and Mistico Arenal Hanging Bridges Park are also within 9 mi (15 km). 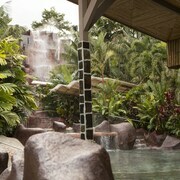 How Much is a Hotel Room in Arenal Hot Springs? 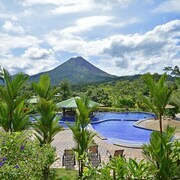 Hotels in Arenal Hot Springs start at $84 per night. Prices and availability subject to change. Additional terms may apply. When you're chasing accommodation options in the area around Arenal Hot Springs, it is useful to know that there are numerous different possibilities awaiting you. 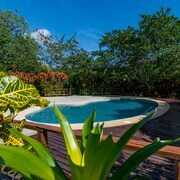 About 87 hotels and apartments await you within a 6-mile (10-kilometer) radius of Arenal Hot Springs's downtown area. Some of the most centrally located accommodation options of downtown Arenal Hot Springs are the Nayara Hotel Spa & Gardens and Tabacon Grand Spa Thermal Resort. 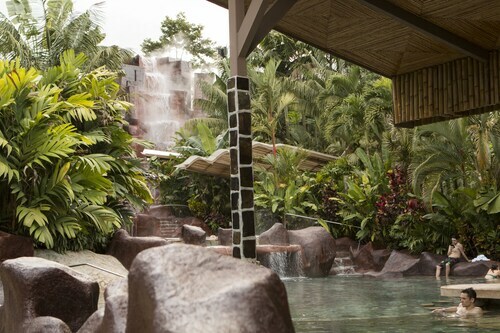 The The Springs Resort and Spa at Arenal is located 2 miles (3 kilometers) away from central Arenal Hot Springs. An alternative accommodation option is the Arenal Kioro Suites & Spa, which can be found approximately 1 mile (2 kilometers) away. 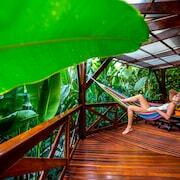 Other possible places to rest your head are the Baldi Hot Springs Hotel and Spa and the Monteverde Lodge & Gardens. After you have spent some time in Arenal Hot Springs, take a trip and discover more of what Northern Plains has to offer. If you love nature, be sure to explore Northern Plains's forests, lakes and active volcanos. In addition, you should venture to its traditional villages, craft workshops and open-air markets. 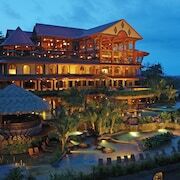 In this corner of Costa Rica adventurous visitors can enjoy hiking and shore fishing. 1 mile (1.6 kilometers) away from Arenal Hot Springs, you will find Fortuna, which is where you can spend a few hours exploring Baldi Hot Springs and La Fortuna Waterfall. A few Travelocity-listed Fortuna rooms include the The Royal Corin Thermal Water Spa & Resort and Hotel El Silencio del Campo. 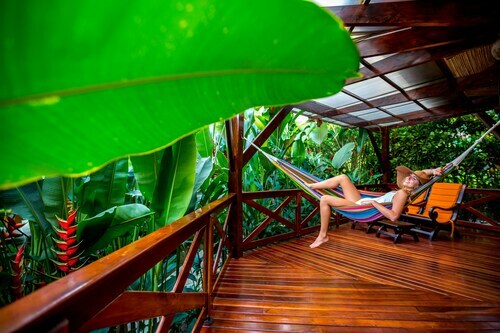 Alternatively, you could consider staying at Aguas Zarcas, 25 miles (40 kilometers) east of Arenal Hot Springs, where you can pick from the Hotel El Tucano Resort & Thermal Spa and Termales del Bosque. If you're staying in Aguas Zarcas, keep a day to explore the Aguas Zarcas Church and Aquas Zarcas Square. Prior to your departure from Arenal Volcano Region, be sure you catch some fast-paced sport. Swing by Saprissa Stadium, located to the southeast of Arenal Hot Springs. Travelocity customers who like the convenience of sleeping close to the stadium, reserve a room in the Hotel Grano de Oro or Crowne Plaza San Jose Corobici. Juan Santamaria International Airport is 50 miles (77 kilometers) from Arenal Hot Springs's town center. Wise visitors who would like to stay close by can reserve a night via Travelocity at the Hampton Inn and Suites San Jose Airport or the Holiday Inn Express San Jose Costa Rica Airport. Amazing place with a great staff. The only rude person we met was the young lady in charge of towels on our first and second day there. Beautiful place! Great pools and slides. Kids loved it. Highly recommend it. Great view of volcano. Property needs some serious maintenance. "Warm" pool is not warm, dirty and many missing tiles. Somewhat dated. Not the friendlies front desk. Landscaping could use some help too. Beautiful setting near many activities. Outstanding fish tacos! The rooms are dated and small, but the pools, hot springs, and staff more than make up for it! The staff were very friendly and happy to assist. The hotel was beautiful and well kept.